I have this strange notion that somehow, if I knit fast enough, I can knit through my stash. I found a skein of Lion Brand Wool-Ease yesterday while searching for something non-yarn related. I grabbed it and started knitting. A day later I have another hat. This pattern is MJ Kim’s Claudia. It’s a sweet, fast knit (as most hats are), and the washable heathered wool is pretty nice too. 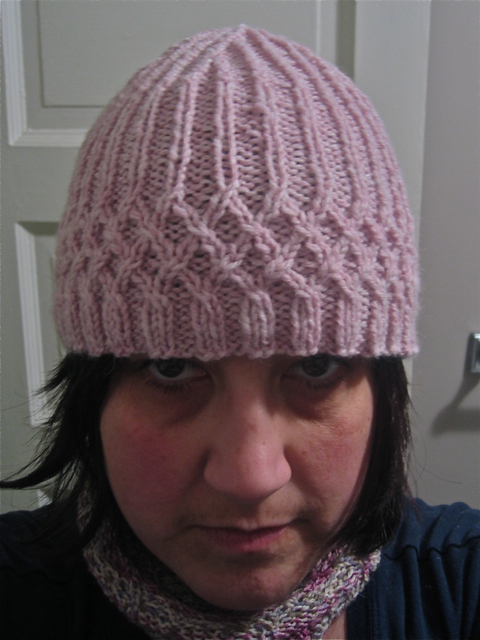 This entry was posted in Knitting and tagged Claudia, knit hat, Lion Brand Wool-Ease. Bookmark the permalink. If you still have the pattern would you give it to me?? Please! !